Tulsa wins third straight against rival Wichita, after Murphy breaks 2-2 tie late in regulation. 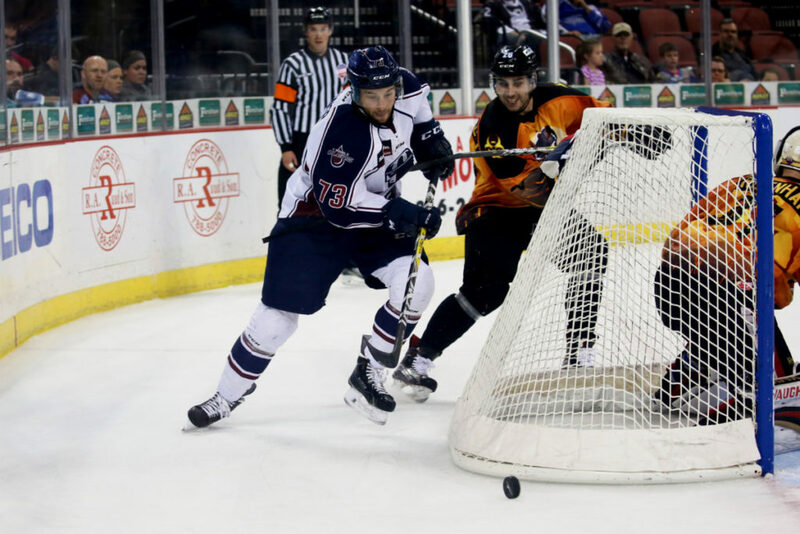 WICHITA, KS – The Tulsa Oilers broke a 2-2 tie late in the third period to defeat the Wichita Thunder 4-2 on Friday at INTRUST Bank Arena in Wichita. It was the Oilers’ second straight win this week against the Thunder, setting up for Saturday’s third straight meeting, this time in Tulsa. The teams skated through a scoreless first periods, as Tulsa held a slight 9-7 shots advantage. Colin Stevens stopped all seven Thunder shots in the frame, while Wichita goaltender Scott Greenham made nine saves. Phil Brewer gave the Oilers a 1-0 lead one minute into the second period with his fifth goal of the season from right between the circles. 50 seconds later, Jessey Astles notched his first Oilers goal to make it 2-0 when he snuck behind the defense and slid a shot through the legs of Greenham. Wichita cut the lead in half, when Alexis Loiseau banked a shot off of Stevens and in on a Thunder power play. Wichita tied the game with 7:59 to play in the third, when James Melindy fired a shot past Stevens from the right circle on another Thunder man-advantage. But Tulsa would take the lead for good, when Ben Murphy scored his first of the season on a 2-on-1 rush with 2:44 left in the game. Brewer, who had a three-point night for the Oilers, set up Murphy with the pass across the slot. Adam Pleskach added an empty-net goal in the final minute for his team-leading ninth goal to seal the 4-2 win. Stevens stopped 25 shots for his first Oilers victory, as the Oilers moved to 13-5-1 on the season. The Oilers and Thunder meet one more time this week tomorrow night at 7:05pm in Tulsa at the BOK Center. Tulsa will wear special Winnipeg Jets Affiliation Jerseys, which will be auctioned off after the game in the OneOK Club on the Concourse Level.